Our newest rescued hens have been coming out of their barns more regularly to enjoy the sunlight and dust bathing. Have you seen this adorable video of them exploring their new home at Animal Place? Also internet and TV famous, some of the chickens and hens were featured on Good Day Sacramento in a segment about our Pay to Tour Program. New Mexico Joe E. Parker Chili Peppers – yes, seriously, that’s the variety name of these Southwestern-style traditional Anaheim chili peppers. They are usually used for stuffing, grilling, roasting, or processing. Check out the recipe below. Rainbow Bell Peppers – you’ll get a mix of green, red, purple, yellow or orange. You can stuff these just like the Anaheims, but they are sweet and taste great raw. Magnifienza and Haogen Melons – fresh-picked but ripe, so best stored & chilled in the fridge. We were lucky to have Rebecca Wolf farming with us for 4 1/2 months this season. She planted most of those tasty melons and all of those summer squash. Rebecca has returned to college, and we missed her dearly today while harvesting this box! Read our thank you note to Rebecca to learn more about how she made such a big difference at Animal Place on our veganic farm. Next month we will welcome a new intern to the farm team, to help us with the CSA and some new farm customers. 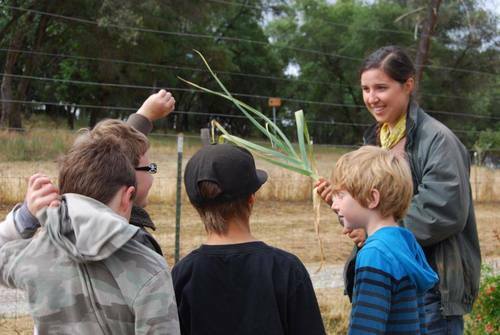 We recently started selling our produce to the nonprofit Tahoe Food Hub. Their Farm to Market program Farm to Market Program promotes regionally-produced and sustainably-grown foods, and helps small farmers get their products to market in North Lake Tahoe. 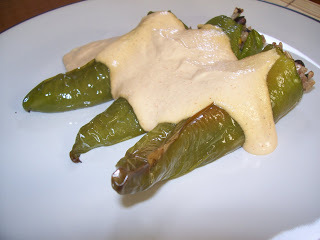 Stuffed Anaheim Chili Peppers covered in Nacho “Cheese” Sauce – by Plant Happy Life! Cook 1 cup brown rice with 2 cups water (its always 2:1). I know people struggle with cooking rice, but just buy a rice cooker and make sure it has a brown rice setting. Really its like Ron Popeil used to say, “just set it and forget it!” Once its cooked add the remaining ingredients and mix it all up. Simply blend until creamy! I have a cheap blender so I have to blend then stir it, then blend again. Repeating as necessary. I used 9 Anaheim Peppers and had about half the filling left, so you could probably do about 18! Simply cut the stems off and use your hands to get a fair amount of the seeds and white stuff out. Lightly oil the outsides of the peppers, along with a large sheet pan so they don’t stick. Now its time to get stuffing! It’s easy to do and went pretty quick for me. Just grab a bunch of the filling with your hands and carefully push it down into the cavity. For energy reasons, I don’t often preheat my oven unless I’m baking cookies or some other dessert. So for me, this is when I would turn on my oven to 350 degrees and pop these babies in at the same time. Bake them until their skin seems soft and just a bit shriveled. Once they are ready, arrange a few on a plate and top with the “cheese” sauce. Q&A: Does organic produce have a greater risk of E. coli?